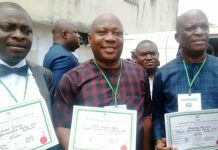 Not fewer than 1,000 members of the All Progressives Congress (APC) in Opobo/Nkoro have crossed over to the ruling Peoples Democratic Party (PDP). 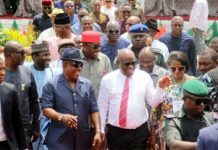 At an event last week organised by the PDP to sensitise the people of the area to massively participate in the voter’s registration exercise, the APC members said they were declaring support for the state Governor, Chief Nyesom Wike. The new PDP members were received by state chairman of the party, Bro Felix Obuah who commended them for leaving a sinking boat to join forces in developing Rivers State. Obuah assured them of equal treatment and better future adding that the PDP has the welfare of the people at heart. Also speaking, member representing Opobo/Nkoro State Constituency, Hon Adonye Diri said the people of Opobo/Nkoro are benefitting hugely from the Nyesom Wike led administration. Diri who listed some of the projects completed and ongoing in the area, reminded the people that the present administration had revived the moribund General Hospital at Opobo, the dilapidated schools at Nkoro and is currently providing potable water and completing the Andoni/Opobo Unity Road. The legislator said, “Opobo and Nkoro have not had it so good since inception of democracy”, stressing that, “Governor Wike will do more for us so we need to support him for a second tenure”. Leader and political chieftain of the PDP in Ward Six in Opobo, Sir Boma Brown said the huge decampees shows that the people of Opobo and Nkoro are in support of the Wike administration. So far, Brown stated that the administration has shown love to the Opobo/Nkoro people as he listed not fewer than five persons appointed in government from the area. Brown said, “we need to reciprocate the kindness of Wike to our people and the only way we can do that is to ensure he continues with his good works beyond 2019”. said the huge decampees shows that the people of Opobo and Nkoro are in support of the Wike administration.